Giving up on an idea? I had the privilege of chatting with a sixteen-year-old writer from Colorado recently. Victoria was one of the winners of the Face Your Fears Weekend Draw, which was open to writers on my Insider Mailing List. Victoria won a private mentoring session with me during which she asked some excellent questions about the writing process. One question, in particular, is addressed in depth in my novel Polly Wants to Be a Writer: The Junior Authors Guide to Writing and Getting Published, but I thought it would also make a great topic to write about as we head into the final week of August, our challenge month. Victoria asked: How do you know when to give up on an idea? The short answer is: It’s an excellent question, but it’s the wrong question to ask. You never have to give up on an idea. 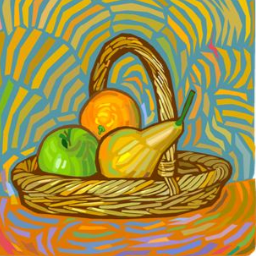 You know how in painting classes you alway have to do the classic paint-the-bowl-of-fruit exercise? Think about this. Put ten professional artists in a room, put a bowl of fruit on a pedestal and say go. They all paint their version of the bowl of fruit. Some will do a realist rendition, some will do an abstract, some will do a tiny painting, others might do a mural. Each artist will bring with them their styles and the subjects they tend to wrestle with in their work. Some of those finished paintings might depict love and nurturing, while some of the bowls of fruit will remind you of neglect. The fruit is just the fruit for the artist. It’s neutral. It’s the style, purpose, and emotion that the artist brings to the subject that will make a bowl of fruit, more than just a bowl of fruit. It’s the same with writers. There are no ideas that need to be abandoned. Any idea, every idea, can become a meaningful, readable piece of writing. The idea is just the bowl of fruit. It’s how you execute your vision of the bowl of fruit that matters. 1. Get an idea and write. 2. Do a little research and keep writing. 3. Focus your idea and keep writing. 4. Write your entire first draft (do not start editing or revising until your first draft is complete). 5. Revise your manuscript until you love it. I think there is a whole bunch of interference going on in the wannabe writer’s mind when they decide to give up on an idea. I think their inner critic (or inner dragon) is piping up too soon. Inner dragons don’t get their say until step five, and by the time you get to step five you are going to be so far long in your piece of writing, that scrapping it just doesn’t make any sense. Every piece of writing that you complete (all the way to proofreading) gets you closer to getting paid to write. There are only so many ideas under the sun; but there are an unlimited number of ways an idea can be expressed. Any idea can be a great piece of writing. Be conscious of the writing process and where you are in it. Muzzle your inner dragon in the early stages and, if you are serious about making it, finish as many pieces of writing as you can every week, every month, every year.